It’s hard to remember another world tournament in which India has been more highly favoured as that of the level of T-20 world cup. Once again India is ready to enter the battlefield with its great warriors in the 2016 T20 World Cup as overwhelming favourite. Our well-balanced squad has a good mixture of youth and experience, possesses genuine match-winners, and has gradually evolved into one of the best fielding units in the world. Their recent T-20 form has been outstanding, with a 3-0 win over Australia, and a dominant display in the Asia Cup. India is in a tough group with Australia, New Zealand, Pakistan, and Bangladesh the winner of group A from the first round. While they will be tested, it’s important to note that they’ve experienced recent success against most of these teams. India will commence their campaign against the kiwis and will likely face their toughest test in the opening game against New Zealand. It would be interesting to watch the clash with the kiwis on 15th march at Vidarbha Cricket Association Stadium, Nagpur. 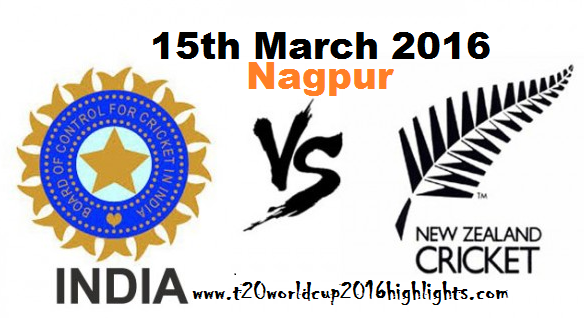 How to Buy/ Book India vs New Zealand Tickets ? 5.Reach Stadium with your ticket. Kiwis are always considered to be a strong contender for the title. They have some exceptional players in their ranks to help them emerge victorious. Ferocious hitters like Martin Guptill and Corey Anderson in prime form, are going to be a strong force in the competition. They also have a good bowling attack, which strengthens their team in the World Cup T20. As far as India is concerned we have one of the best batting line-ups in world cricket. Virat Kohli is in the form of his life, and Dhoni’s been showing glimpses of his old form too. Ravichandran Ashwin and Ravindra Jadeja will pose a serious threat on wickets that are likely to favour spin. Jasprit Bumrah’s ability to bowl the death overs has been a pleasant surprise, and Hardik Pandya appears to be the seam-bowling all-rounder that India desperately needed. If we talk about New Zealand team we can never forget that during the inaugural T20 world cup in 2007 they were the only team to beat India who went on to win the cup. But this time our captain cool MS Dhoni is looking forward to end a sorry record of having never beaten New Zealand in a T20 game. So it would be great fun watching these two teams live on tuesday.